Situated along a lovely secondary road in Lugano, this 2-storey lake view villa offers a blissful setting for year-round breaks. Comfortably sleeping up to 10, the 4 double bed retreat offers a chic and carefree retreat to call home. The fully-equipped WIFI enabled interior is complemented by a sunny lake view garden with a choice of alfresco seating and dining areas. Situated within easy reach of the modern highlights and transport links of Lugano, guests are perfectly placed for enjoying a sleek city lifestyle, as well as the natural beauty and tourist sights of the surrounding Ticino region. Boasting plenty of natural light and space, the inviting lake view reception offers a scenic setting in which to kick off your shoes and socialise. The sleek white kitchen offers a functional family-friendly space from which to rustle up tasty homemade meals throughout your stay. The 2-storey villa also benefits from laundry and ironing facilities. The holiday home features 28 internal steps. Outside, the modern villa features 52 external steps. Its lovely sunny lake view position provides a breath taking setting for daytime relaxing and ambient evening entertaining. A sunny lawn is complemented by a covered lake view sitting area, a sunny alfresco area and a year-round covered terrace; with glass topped dining area and rustic BBQ. A private parking space and garage features to the villa. From its scenic setting along a residential secondary road, the cosmopolitan highlights of Lugano are within easy reach. The fashionable lake capital is home to a lovely family-friendly Lido, a tennis and golf club and timeless boating opportunities; as well as a plethora of designer shops, cultural attractions, world restaurants, stylish bars, modern casinos and an international airport. 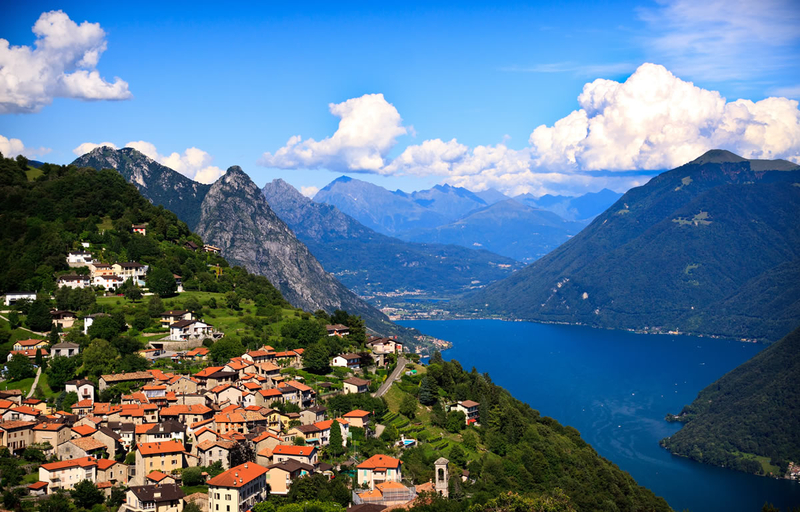 Lugano also offers the perfect starting point from which to reach the walks of Mount Bre and the historical Olive Trail in Gandria; as well as the family activities of Mount Tamaro and the attractions of neighbouring Lake Como.